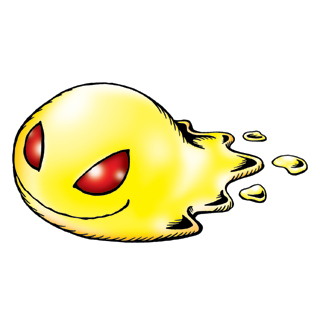 It was produced from the fusion of an extra-malignant computer virus and a computer hacker's evil desires, an evolutionary origin which differs from other Digimon of the special Slime type. It operates its supple body skillfully in order to crawl across the ground. The substance that composes its body is powerfully toxic, and because it spews Venom-tinged Bubbles out of its mouth, even larger Digimon won't approach. A Digimon that was born from the fusion of a super-malignant computer virus and a computer hacker's evil desires. 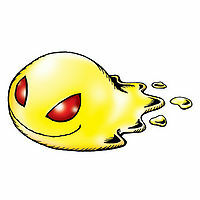 A special Slime type Digimon whose cause of outbreak is unique from that of other Digimon. It is dexterous with its mollusk-like body, moving from place to place by crawling across the ground. The substance that composes its body is powerfully toxic, and because it spews Venom-tinged Bubbles out of its mouth, even larger Digimon won't approach. | Zuru comes from zurui 「狡い（ズルイ）」, which means sly or cunning. Anime/Manga Digimon Frontier: "Protect the DigiTama! The Miracle of Disappearing Life"
Spits out severely toxic material to avoid larger Digimon. Poison Bubbles Spits out severely toxic material to avoid larger Digimon. Appears as Pico Devimon's minion in the Plains area, evolves to Koromon when defeated. Zurumon can be found at Slippery Swamp. It evolves into Caprimon with 20+ Machine AP, Pagumon with 20+ Darkness AP and Mochimon through time. Zurumon is available as a Digimon Medal. This page was last modified on 9 April 2019, at 02:04.